The holidays are rapidly approaching...only 20 days left till Christmas (for those of you who are counting) and along with spreading cheer, RSVP's to holiday parties, and what seems like never-ending Christmas shopping, there is barely any time left to find a fun holiday recipe to share with all of your loved ones. Luckily, I found a festive treat that is perfect for any sweet tooth craving ;) or holiday gathering you may be hosting/attending. Anyway, below is the recipe from Hostess With The Mostess for these celebration worthy sweets! I promise they are just as simple to make as they are to enjoy! 9. Place in a styrofoam block to dry. 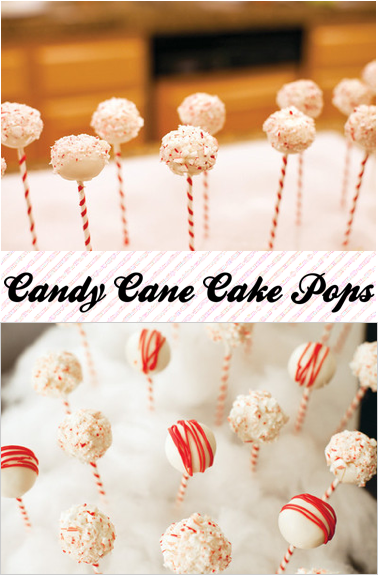 * For Design #2, (the “smooth” design) let dipped cake pops dry, then add a few red Candy Melt stripes on top. Using a zip-loc bag with a tiny piece of one corner snipped off, drizzle the melted red candy back and forth across the top of each cake pop. OR if you are like me & are a visual learner ;) click here for picture step-by-step directions! Will you try this recipe? What is your favorite holiday treat? Bon appétit & Happy Holidays!